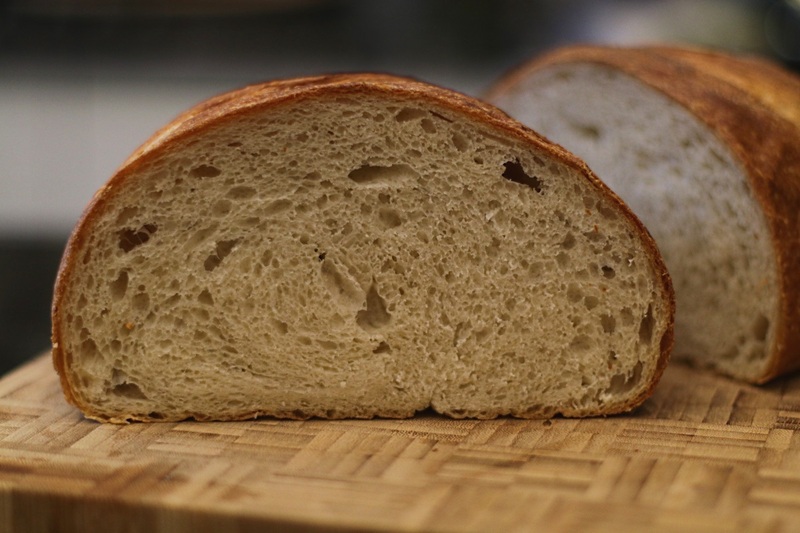 Bread with a looser crumb (holes in the bread structure) looks good, tastes great and is the goal of many artisan bakers. I have learned that using a pre-heated baking stone (in my case a pizza stone) to kick-start the rise, or oven spring, is an important factor in achieving such hole-i-ness. Consider pizza crust. Baked at temperatues of up to 500°C in a professional pizza oven, it rises rapidly at the edge, forming a network of small holes and tunnels within the pizza. 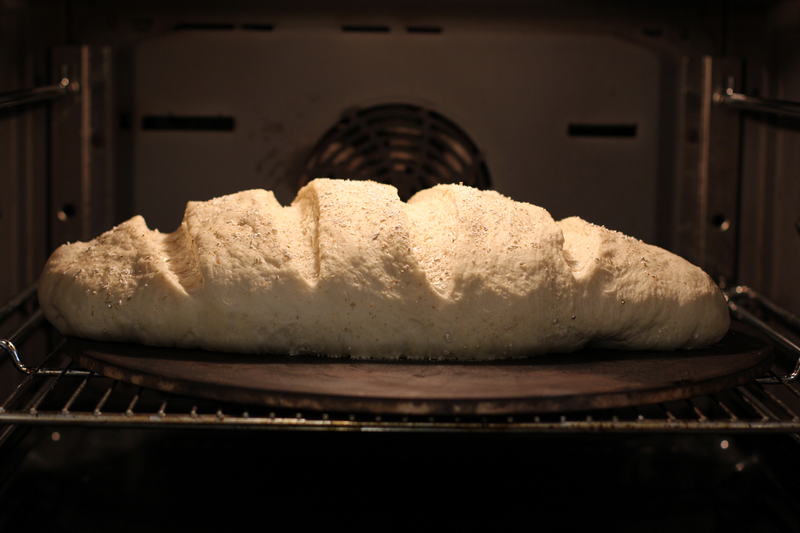 This is oven spring, the rapid expansion of dough during the first few minutes of baking, caused by heat energy accelerating fermentation and expanding air bubbles. The same principle applies when bread dough is placed on a pre-heated pizza stone. 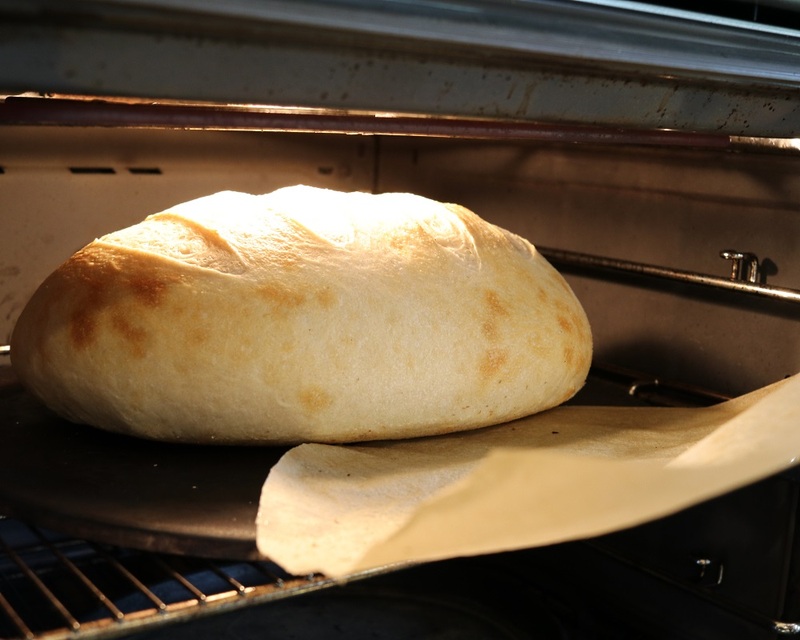 The stone transfers heat to the dough quickly, kick-starting the oven spring, which leads to a looser crumb. Wait … A Pizza Stone To Bake Bread? … and, of course, one large pizza. On the rare occasions I bake more than this, I do it in two batches or cook at different levels in the oven using two pizza stones. Or use two loaf tins. If you bake more than this regularly, a larger rectangular baking stone may be more appropriate. Kiln shelves are a low cost alternative. However, consider that larger stones needs more heat energy to get to temperature, so costs more money for each bake. A pizza stone absorbs heat energy as the oven warms up. It warms up slower than the oven, so it needs to be pre-heated well in advance of the actual bake. Now for the really important bit. Get the stone as hot as possible, up to 275°C (or as much as the stone can handle). More heat energy gives a better spring. When you add the dough to the oven, be sure to turn the temperature back down to what you should be baking at. The time to do this mostly depends the volume of the stone … larger stone, longer warming time required. A thermapen can determine if a stone is at temperature. If this is not available, a good rule of thumb is to start warming up the stone at the start of the dough’s second rise. The extra oven spring from the pizza stone will need scores to be a little deeper and longer. In the picture above, the loaf was scored with the same depth as normal, and as can be seen the score stretched to being flat. 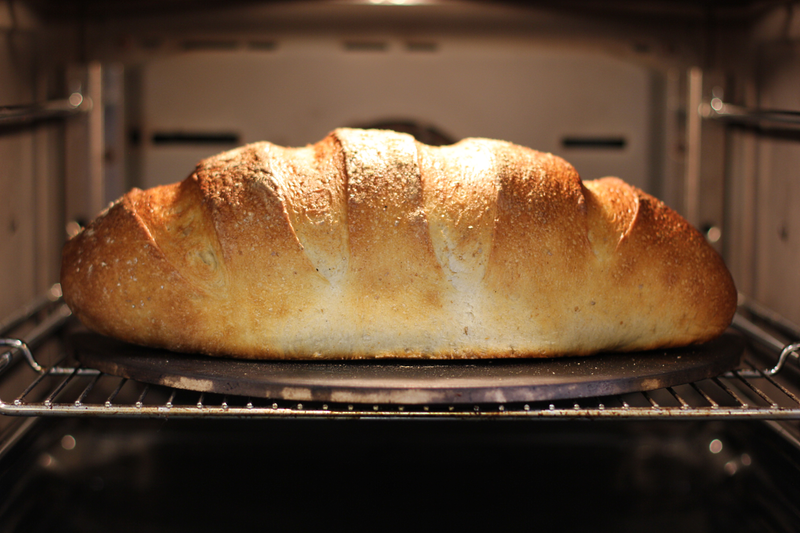 Deeper scoring would have allowed the loaf to have even more oven spring. 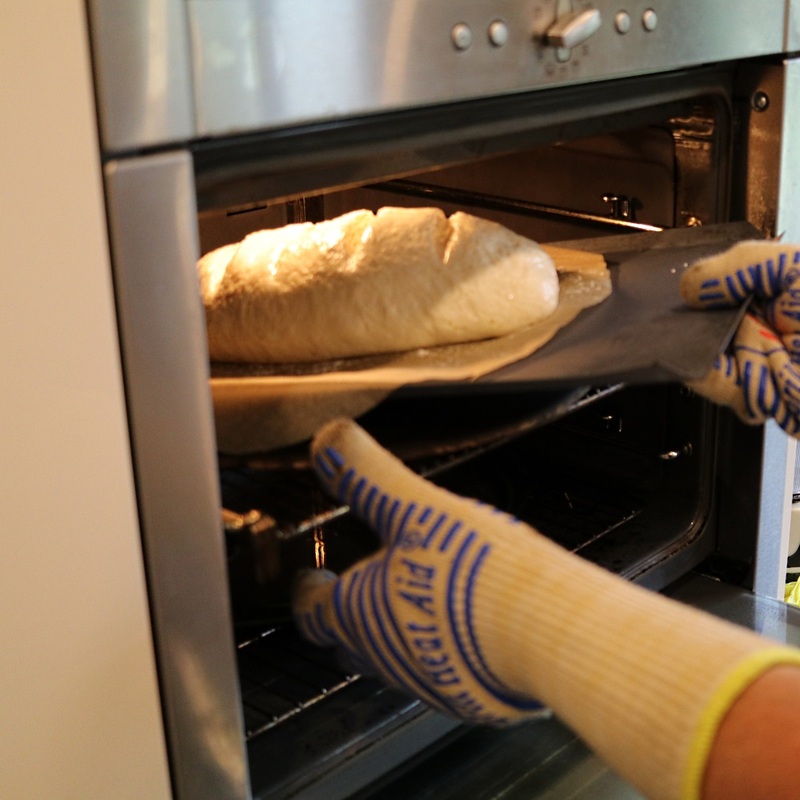 When moving dough onto a stone inside an oven, the aim is to minimise the time the oven door is open and keep the dough in the same shape. 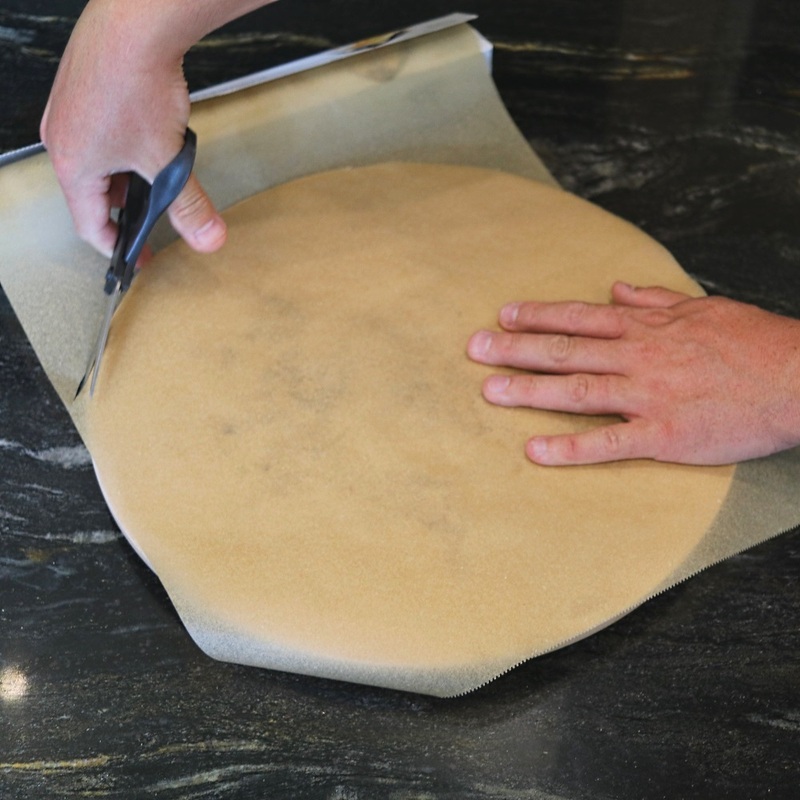 An easy way to achieve this to begin with is to do the second rise on oiled/floured baking parchment (not greaseproof paper). Then slide the parchment from the proving tray onto the pizza stone. Heat is conducted rapidly through the parchment when it touches the stone. 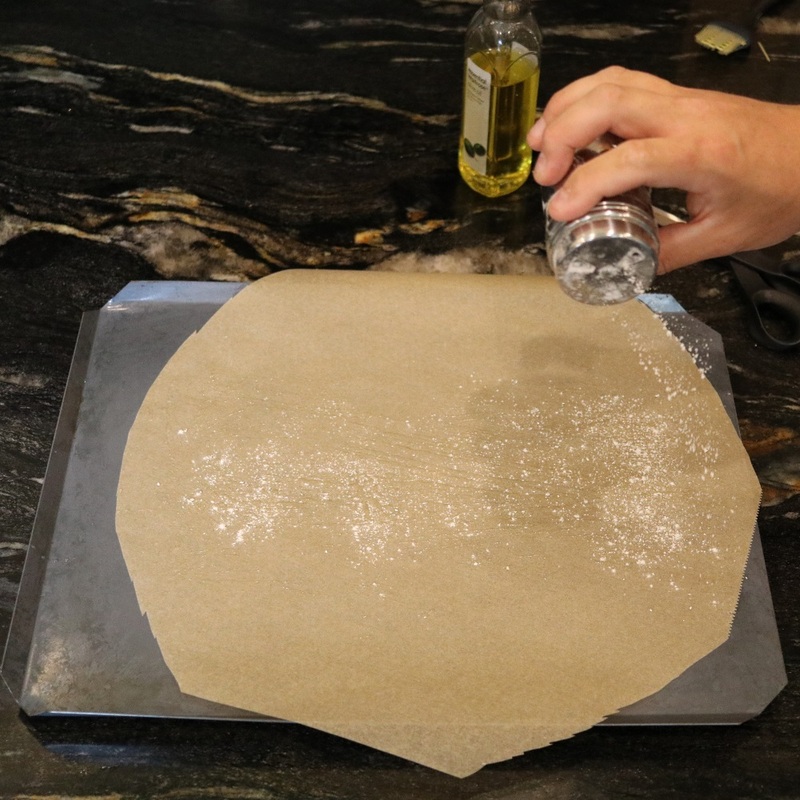 The parchment can be removed after ten minutes, as the dough’s base will have hardened by then. If you have one, you can also use a pizza peel, ideally a wooden one. The oven door is open for minimal time and there is full contact between dough and stone. It’s also the most difficult to execute correctly. The action must be quick and decisive both loading the dough onto the peel and delivering it to the oven. 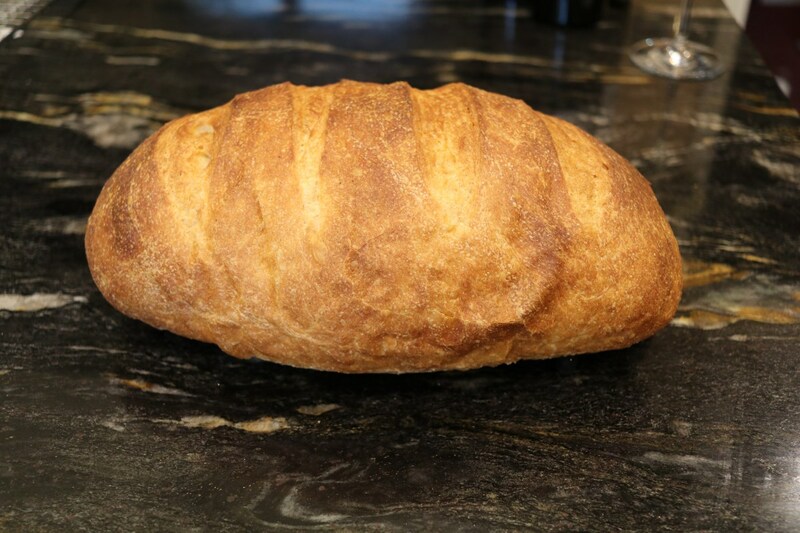 The loaf above was made using the easy home-baked bloomer loaf recipe , but baking on a pizza stone. There is a better rise when compared with using a baking tray from room temperature. So that’s one method of getting an artisan style look to your bread. There are other ways of achieving this, e.g. using high hydration dough. I’ll be covering this, and more, in future blog posts.